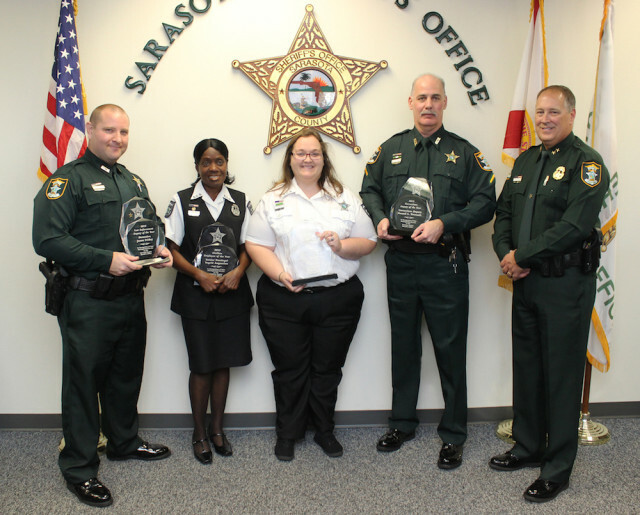 On March 30, Sarasota County Sheriff Tom Knight honored his 2015 Employees of the Year, the Sheriff’s Office has announced. Deputy Jason Friday was named 2015 Law Enforcement Deputy of the Year; Ingrid Augustine, senior paralegal for the Sheriff’s Office, was named 2015 Civilian Employee of the Year; Tia Brand received the 2015 Emergency Operations Bureau Quality Assurance Award; and Deputy Russell Tetreault was named 2015 Corrections Deputy of the Year, a news release says. Friday was honored “for his incomparable skills, knowledge and expertise” in the area of economic crime, the release notes. Since Friday joined the Criminal Investigations Section in 2011, he has taken an active role in investigating organized retail fraud and theft, the release explains. He “regularly provides training to colleagues and law enforcement agencies across the state, the release adds. Friday also was honored by the Florida Retail Federation as the 2015 Law Enforcement Officer of the Year, the release continues, and he was a finalist for the Florida Attorney General’s Law Enforcement Officer of the Year award. In her position, Augustine “regularly handles legally complex work for the agency’s general counsel’s office,” the release says. “In 2015, she demonstrated outstanding leadership” in the transition from three members to five on the legal staff by training new personnel while balancing her own work, the release notes. Augustine also dedicated several hundred hours to legal research and preparation related to a lawsuit that was ultimately dismissed in federal court, the release adds. After completing the call-taking program, Brand, who is an Operator II, proceeded through emergency medical dispatch and emergency fire dispatch training before becoming a communications training officer, the release explains. The Quality Assurance Award is based on a combination of overall quality assurance scores, the number of calls audited and scores on instructions given to personnel before they arrive on a scene, and Brand scored 99.89 percent on all calls reviewed, the release points out. Brand was also recognized in 2014 for a score of 100 percent, the release notes. Tetreault “exemplifies agency values and is noted for the respect he shows not only his fellow deputies but the inmates he deals with on a daily basis,” the release says. He is a field training officer for the jail’s booking unit “and does an exceptional job” in training new recruits, the release adds, “giving them focused attention and sharing his institutional knowledge. His work ethic, integrity and professional demeanor can help calm the unruliest of arrestees,” the release continues. Tetreault “provides an outstanding example for new employees and peers alike and is someone this community can truly be proud of,” the release adds.